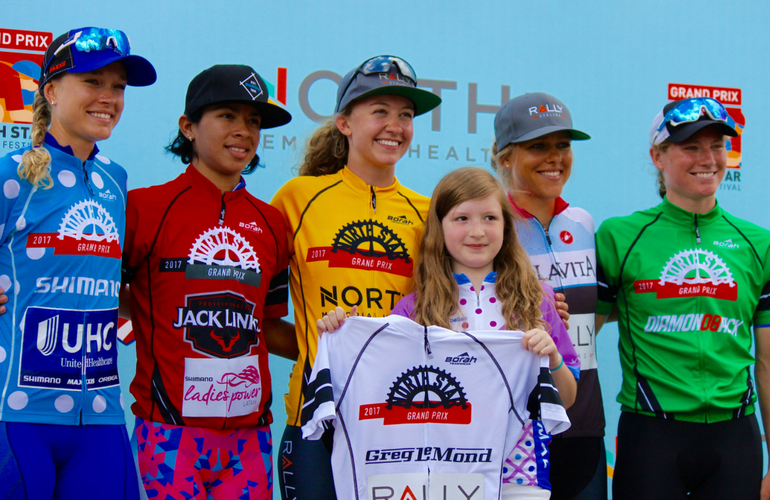 The Minnesota Little Bellas had the opportunity to give out awards for the North Star Grand Prix Pro and Amateur bicycle races in MN June 14-18, 2017. This opportunity was won through a raffle at the Pedal4parity event, an event celebrating women in sport through the lens of cycling, whose aim is to bring together the local and national communities of women who pedal bikes and those who support them. Pedal4parity provides a platform to discuss the current disparities between men's and women's cycling and how we can all act together as a positive force to move towards parity for all genders. 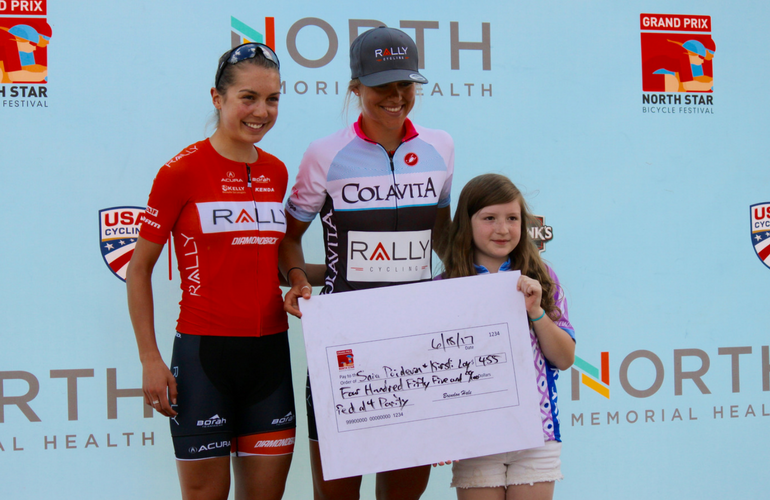 Pedal4parity raised money to provide cash primes for the 3 criterium races in the North Star Grand Prix, and Little Bellas representatives from the Woodbury, MN chapter were on hand to present these awards at each event. Wednesday night was the first of the criterium races and took place in St Paul on Grand Avenue. The course was a big rectangle which afforded the riders great speeds and action. Little Bella Sandy handed out the Amateur lead jerseys for the Time Trail race that happened earlier in the day, then was able to do the same for the Criterium race, plus hand out the Pedal4parity prime award. She found her groove on stage celebrating these racers. Friday night was another Criterium race, this time in the Uptown neighborhood of Minneapolis. Big crowds attended this weekend event with a more challenging course. Tiana, Little Bella mentor and track cyclist extraordinaire presented the Pedal4parity prime award. All in all a wonderful few days of bike racing in MN that the Little Bellas girls and mentors greatly enjoyed. So fun to watch the strength and composure of these pro and amateur riders.